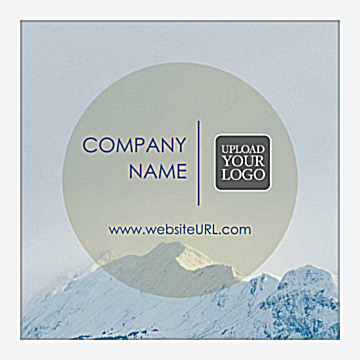 Impress clients with our Mountain Peak sticker design template, great for companies that specialize in outdoor tourism or sports, mountain guides, outfitters, or any company wanting to impress to clients that they operate at a high peak of performance. Mountain Peak features a snowy mountain peak image below a blue sky. Superimposed on the image is a neutral circular field with space for your company name, website URL, logo, or other custom text. Mountain Peak is available in two shapes, three edge finishes, and five different color options to accentuate your brand. Personalize your stickers with our easy-to-use design tool today! Our online design tool will help you create and print custom stickers that will help you promote your brand anytime, anywhere. Simply select your template and color options, then personalize your design by adding your company name, logo, website URL, or whatever text you prefer. Once you’ve finished designing, you can select your sticker paper options and printing turnaround and place your order. It’s that easy and fast! And if you want to share your design before printing, you can download a free PDF for friends and colleagues and get valuable feedback. Affordable pricing and great value make PsPrint’s custom stickers a great choice for marketing your business. We use only premium, high-quality sticker paper stock and vibrant, richly-colored inks that make your stickers stand out—satisfaction guaranteed! Interested in displaying your brand advertising on windows? We have window clings! Want to display promotional stickers outside? Go for our vinyl decals, perfect for indoor or outdoor use. If you need assistance creating your custom sticker, our custom printing team is ready to help you get the perfect sticker. And, don’t forget PsPrint offers a full line of additional print marketing materials. Print for success with PsPrint!